Please, if you have anything you can share or show on this site, drop me a line too. 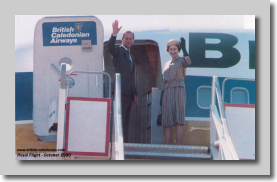 Their arrival was recorded by BCal News and here we have the photos and transcript of that day, 30th October 1980. Royal Flight Caledonian One made a perfect touchdown and, with the Sovereign's personal standard fluttering from the flight deck, taxied to a halt. B.CAL had brought the Queen and Prince Philip home. 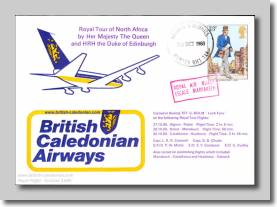 Bright autumn sunshine and a battery of Press cameras greeted Her Majesty and HRH The Duke of Edinburgh when they disembarked from our 707-320C G-BDLM ‘Loch Fyne' after their 2 hour 10 minute flight from Casablanca to London Heathrow. The departure from Morocco had been delayed by almost 25 minutes, through no fault of the airlines, but Captain Rex Cotterell and his crew managed to make up much of the lost time and 'Lima Mike' was only seven minutes behind schedule when she touched down on Heathrow's runway 28 Left. 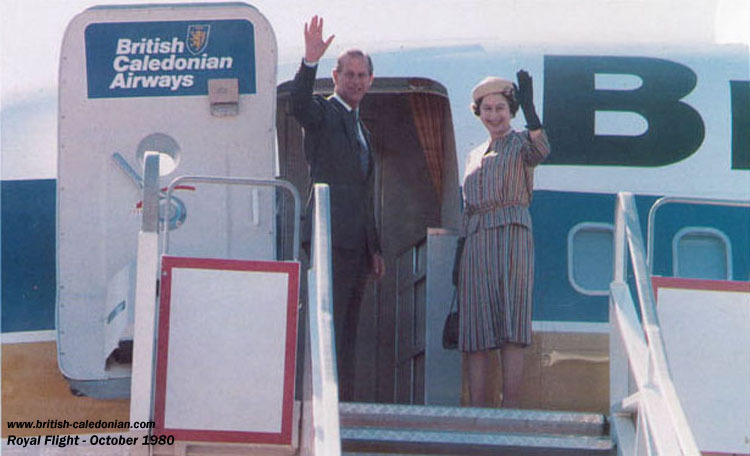 Waiting to welcome the Queen was Chairman, Adam Thomson, who later told B.CAL News: "Her Majesty and Prince Philip said they had enjoyed their three 'very good' flights with British Caledonian". "There can be no doubt that our important part of the Royal tour of North Africa was a great success. The flights were meticulously planned, the aircraft skilfully prepared and the operations carried out with dedicated professionalism which made me very proud". 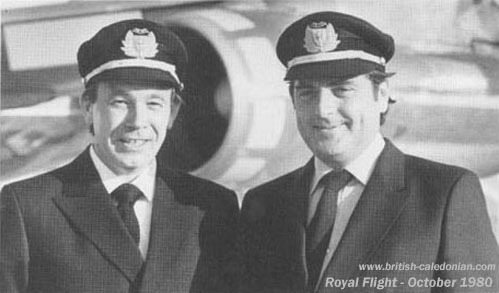 Organisation of the Royal flights was co-ordinated by Project Director J. R. Sidebotham and by lan Keppie, General Operations Control Manager. "Everything went very well from B.CAL's point of view; first class," Ian commented. 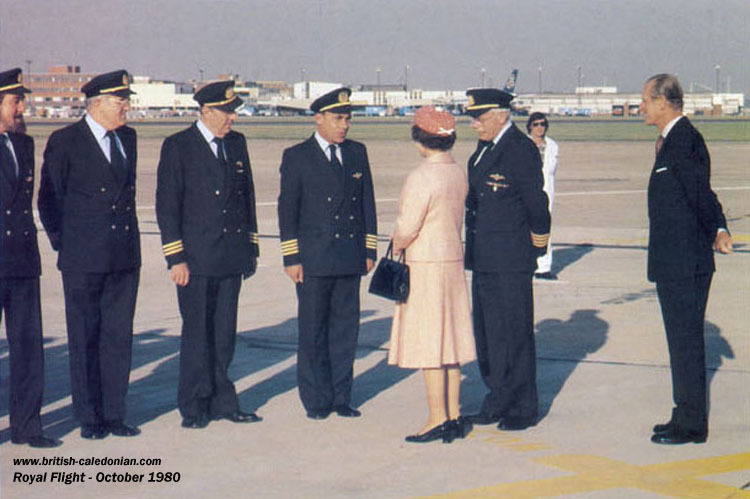 Captain Cotterell, Manager of our Boeing 707 Fleet and Commander of the three Royal flights, saluted smartly as the Queen and Prince Philip approached for the traditional presentation of crew members and other staff who had been closely involved with the flights. 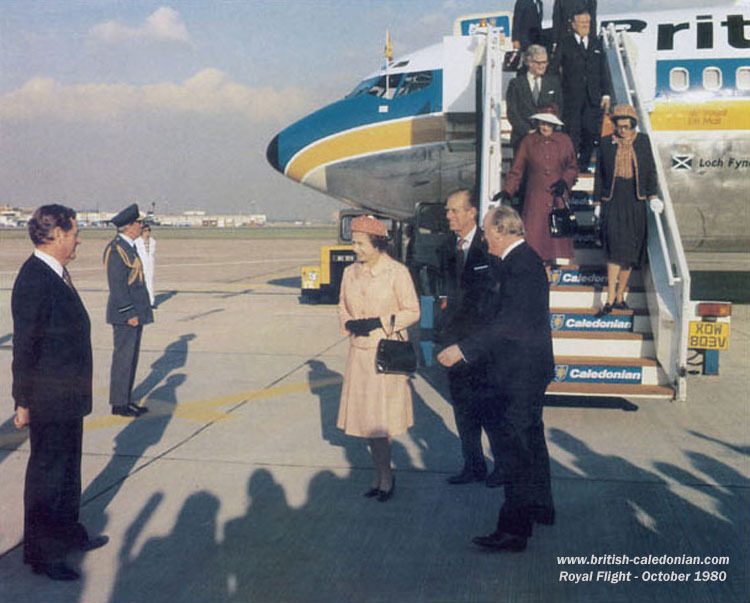 "I wasn't nervous until I saw the Queen walking up the steps towards me" said Flight Hostess Judith Roberts of Hove, who was in charge of service in the Royal cabin. "Only then did I realise that this was the big moment, "But once they were seated and we were on our way I lost my nervousness. Prince Philip was very friendly and helped to put Irene and myself at our ease." "When I and other crew members were presented at Heathrow the Queen thanked me for three pleasant flights." The success of the B.CAL operation was entirely due to the terrific teamwork displayed by all concerned and everyone has good reason to be well pleased. Below: Captain Rex Cotterell, 707 Fleet Manager and Commander of Lima Mike which operated the Royal flights, presents other members of the flight deck crew to the Royal couple. From left Senior Engineering Offices George Dudley and Eric Goodyear, Senior First Officer Bill Mister and Captain Don Chubb; Deputy Commander. Engineering Supervisor Brian Leary and Assistant Station Engineer Gerry Mulhern, who travelled with the aircraft throughout the tour, said they had encountered few, only minor, problems. "The aeroplane went like clockwork" said Gerry, a comment which will be welcomed by Engineering Division staff who prepared for the Royal flights from Algeria to Rabat on October 27, from Rabat to Marrakech the following day and from Casablanca to London. It would have been ideal for B.CAL if the Royal tour could have been completed at Gatwick, but after a gruelling, 17-day tour of Italy, the Vatican, Algeria, Tunisia and Morocco, the Queen wished to arrive to Britain as near as possible to Windsor Castle. For the arrival at Heathrow the Queen wore a pale pink dress and coat with a pillbox hat in deeper pink and black patent accessories. Travelling in the rear cabin of the aircraft with the Hon. Douglas Hurd, Minister of State for Foreign and Commonwealth Affairs, were members of the Royal Household. In appreciation of the work of the cabin staff the Captain of the Queen's Flight, Air Commodore Sir Archie Winskill, presented a huge basket of flowers to the six hostesses and one steward. Flight Hostess Frances Farrell, of Horsham, was in charge of service in the rear cabin. She was assisted by Senior Hostess Suzanne Pipe, of Nutley. Sussex. Senior Hostess Sylvia Wood, of Morley, Yorkshire, Air Hostess Sarah Truelove, of Sunbury-on-Thames, and Air Steward Patrick Pooler, of Bury, Lancashire. Flight Hostess Bronwen Lloyd, of Haywards Heath, and Senior Hostess Sheelagh Hazlerigg, of Brighton, were standby cabin crew members. Many staff members, too numerous to mention all of them by name; share the credit for the success of the Royal flights. 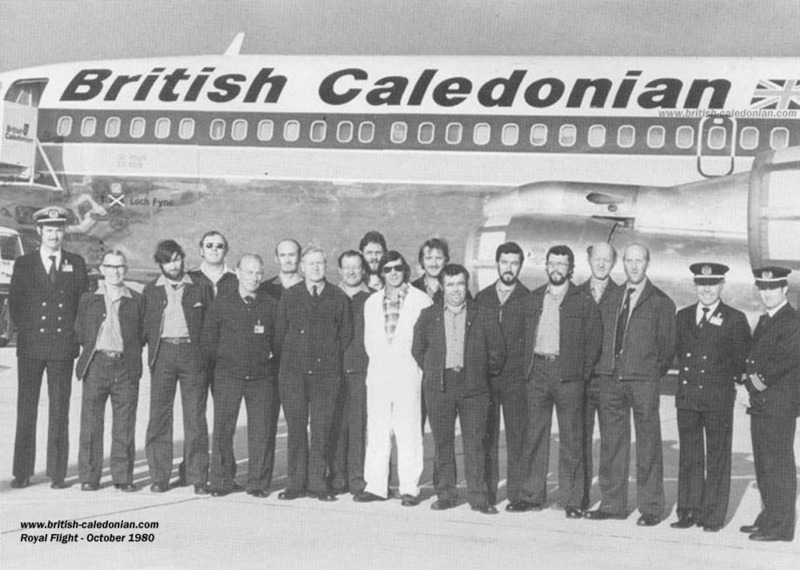 The Royal Flight was handled at London Heathrow by BCal staff, and below we have a photo of the team there. Line-up of the B.CAL Engineering and Operations Divisions ground staff who handled the arrival of the Royal flight at Heathrow. The Oueen has instructed me to convey to you her warm appreciation for the way in which British Caledonian made her flights in North Africa and her return to London so pleasant and comfortable. The high standard of efficiency of both the aircrew and those responsible for the preparation and maintenance of the operation contributed significantly to the success of that part of her tour. 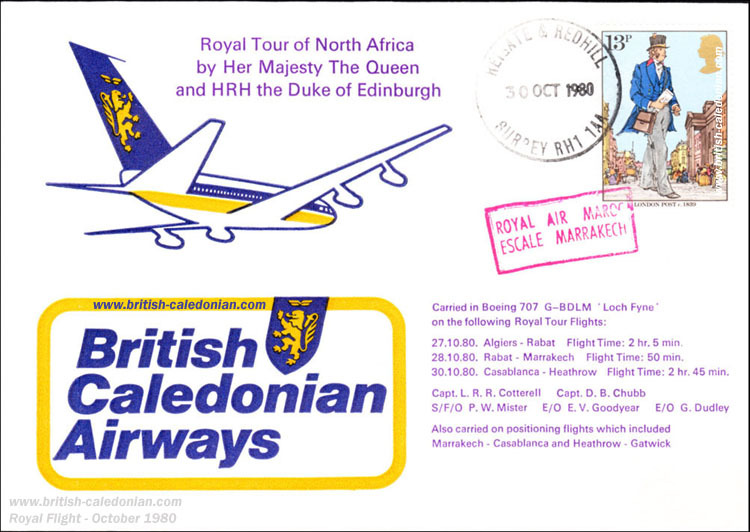 Her Majesty is aware that the mounting of special Royal flights of this nature involves a great deal of extra work for many people and she wishes you to express her thanks to all the members of the British Caledonian staff concerned.